Willie "Bill" Edwin Haberecht was born at Henty, N.S.W., where he was also educated. In about 1928, he purchased a soft drink company in Lockhart, and named it "AVOR" - a name derived from the amalgamation of his two daughter's names - Avrille and Oriel. Through Bill's drive and initiative, the business expanded to Junee, just prior to World War II, and became the largest employer in town with a staff of forty. Through a fleet of trucks, he supplied most of the towns within a radius of 240km. As business grew, Avor's diversified into syrups for water and milk drinks, pies, jelly crystals, Worcestershire Sauce and bottling of vinegar. With the advent of World War II, Bill's daughter Oriel left school and joined her father in the business. "As most adult males had enlisted and staff were short - Dad and I worked over the Christmas-New Year for 8 days and 8 nights without sleeping - this was to keep supplies of our Ginger Beer available which was our bread and butter at the time." In 1946 Bill transferred his business to Wagga Wagga as the water supply was superior. 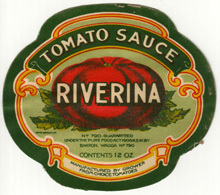 Here, the Avor tradition and quality continued, and Bill added "Cappy's" Tomato Sauce to his expanding range of products. Bill's son Daryl was now assisting in the business. Daughter Oriel returned to Wagga permanently in 1965 and became associated with the business until its closure in 1969, following Bill's retirement. Avor's greatest achievement was its famous ginger beer, which is fondly remembered in Wagga to this day. The formula was never written down, but memorised by Bill and Oriel. Part of the secret was that genuine ginger roots were imported from Jamaica, brewed with yeast in wood and at a certain stage, were bottled and pasteurised, so that the ginger beer always remained the same in the bottle. In the mid-1950s, 250 gallons (1137 litres) of ginger beer (6000 bottles) were made, but production rose to 1000 gallons (4550 litres) per week during the height of summer. Even now, the name Avor evokes nostalgic memories within the Wagga community, as people fondly remember the quality of Avor products. Charles Henry Bardwell 'Bartle' Nixon was born in 1884, at Wagga Wagga. At the age of twenty-five, his business began when he pitched a tent on the river bank at North Wagga, and sold watermelons to passing bullockys. Later, Bartle had land agent Reg Purtle drive him around to view blocks of land on which to build a permanent business. All the blocks at this time were heavily forested. Bartle selected one covered with large gums, and hired Lachie Seppings, who had a traction engine and winch, to clear the land. After his land was cleared, Bartle built a home on the plot (located next to the Black Swan Hotel), and across the road, he constructed a dairy, made from flattened kerosene tins. The house, which still stands today, was built from Cyprus pine logs which were carted from Woodland Station, approximately 30 miles downriver, using a 10 horse wagon. By 1914, the business was booming, with 17 men were employed. That same year, Bartle ordered a Ruston Hornsby Suction gas engine, which would be used to irrigate his market gardens. The engine ran on charcoal, and was imported from England. Dan Kelly, the engineer, came out with the engine, and installed it in North Wagga. A grand occasion, even local identity Hubert D'Hudson came to witness the proceedings! Glasshouses - the earliest in the District - were erected on Nixon's site for his tomato crops. The houses operated with a donkey boiler at one end, with a two inch pipe connected. This kept the glasshouse warm, with the boiled water travelling along the pipe. Bartle's workforce made a weekly run to Marrar, Coolamon and Ganmain selling his produce, which included: tomatoes, pumpkins, lettuce, carrots, potatoes, parsnips, cucumbers, beetroot and of course, watermelons! Cornelius Sheekey, the son of Irish immigrants, established a cordial works in Goulburn in 1868. Two years later, his brother Patrick, established a similar business in Yass. Patrick's son, Terence (known as "T.J.") succeeded Patrick and in 1895, the Yass company became T.J. Sheekey Ltd., Yass. In 1926, the Federal Brewery site on the Esplanade - previously occupied by Mahon & Headley, Brewers and Malsters - was sold to a newly formed company called T.J. Sheekey's Aerated Waters. T.J. Sheekey (manager of T.J. Sheekey Ltd. Yass), T.S. Sheekey (managing partner of C. Sheekey & Co., Goulburn) and J.C. Sheekey (Wagga solicitor) headed the new Wagga Company. By 1928 the name had become Sheekey's (Wagga Wagga) Ltd. And in 1937, Sheekey's (Wagga Wagga) Pty. Ltd. The list of original shareholders reads like a who's who of Wagga's most prominent businessmen. They included: E.E. Collins (many times Mayor of Wagga), W.G. Huthwaite (Department store owner), J.F. O'Regan (member of the Legislative Council for nearly 20 years), D.W.W. Martin (a prominent doctor) and J.J. Byrnes (Hotelier - The Pastoral Hotel). All of Sheekey's shareholders were local families, all of whom handed down their shares from one generation to the next. T.S. Sheekey managed the Wagga operations. By 1930, Sheekey's was supplying most of the hotels and cool drink shops locally. In addition, Sheekey's products were being exported to Young, Junee, Bethungra, Urana, Lockhart, Narrandera, Holbrook, Tumut, Tumbarumba, Cootamundra, Coolamon and other towns in the district. T.S. Sheekey died in March 1955, and was succeeded by Cornelius William Sheekey. He, in turn, was succeeded in 1956 by Neil Sheekey, who headed the company for many years. 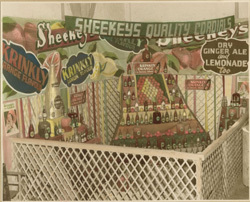 As costs rose, and local and national competition increased, the Sheekey's Soft Drink factory closed on 5 May 1978, after 53 years of manufacturing cordials on the same premises. The business was sold to Websters Soft Drink Pty. Ltd.
William Eaton & Company was one of Wagga's early entrepreneurs, who began producing beer and soft drinks from 1871 onwards. Operating out of a site on the Esplanade, by the 1880s, Eaton was producing soda water, lemonade, square sarsaparilla, ginger ale, curacao, ginger cider, orange bitters, non-intoxicating lager beer, stout and vinegar. A number of cordial businesses have operated in Wagga Wagga since the late 19th Century. Some of the best-known and loved include Mahon & Headley, T.S. Bells and the Crystal Cordial Company. In 1926, there were two main cordial factories operating in town. These were T.J. Sheekey's Aerated Waters in the Esplanade, and the Crystal Cordial Factory, operating in Travers Street. Crystal Cordials, established in 1916 had the "latest machinery" including a shield bottling machine which could turn out 1000 bottles daily. In 1917, a popular product manufactured by the Crystal Cordial Company was dandelion ale. Unlike the later firms like Avors, Crystal Cordial was practically confined to Wagga. In 1939, T.S. Bell & Son operated from premises at the rear of Fitzmaurice Street - at that time, the central business district of the town. Bell's range included Soda Water, Ye Olde Englyshe Brewed Ginger Beer, Superior Lemonade, Sparkling Dry Ginger Ale (Non-Intoxicating) and Passion Delight.